After some delay, well, several separate delays and all kinds of issues all over the place to wade through, I’ve now got two ebooks and one actual book all ready for millions of eager readers to buy, in what I hope will be more convenient ways. Like Amazon, I think we’ve all heard of them haven’t we. Now, on Amazon, these books, by me, all Kindled up and ready to go. But wait! Don’t leave yet. I’d rather you bought them directly from me, as that way I get more of the money you pay rather than Amazon getting it, and I’ll appreciate it more than Amazon does. So you can also buy them here on this site. 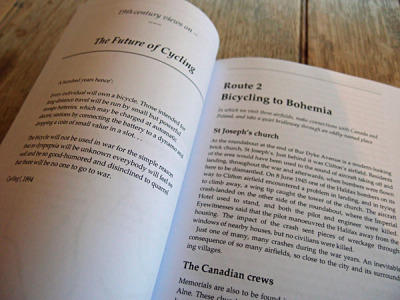 Earlier this year I put both of the ebooks onto gumroad.com to sell them through that rather nice-looking service. I know a couple of people had difficulties/charges because of the currency conversion involved. It didn’t seem as straightforward as I’d hoped, which is why they took a back seat for a while. So, Amazon it is, for the ebooks, as I knew it probably would have to be, in the end. 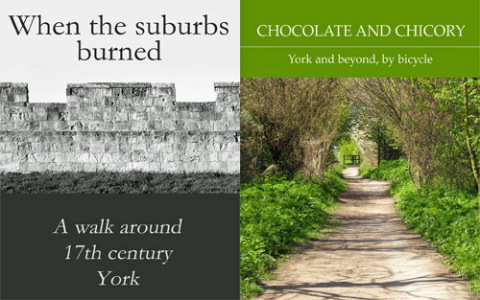 If you’ve already read either Chocolate and Chicory: York and beyond, by bicycle or When the Suburbs Burned and feel like adding a positive review on Amazon, that would be appreciated. But of course what you really all want is this actual book made from paper and shiny card. 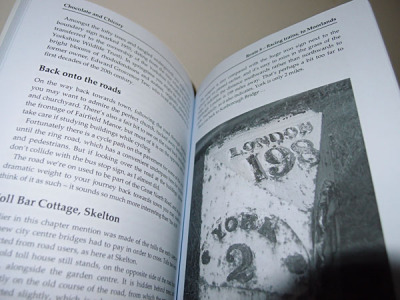 It’s a life-enhancing journey, well, quite a few journeys actually, through the local landscape. And now, after a brief rest, I’ll be getting on with the next one, already sketched out and partly made. By Lisa @YorkStories • 14 December 2014 Uncategorized To link to this page's proper location please use the > permalink.